Our giant Western-themed bounce house looks amazing inside and out with a giant cowboy boot and saguaro cactus on the front along with great western artwork. 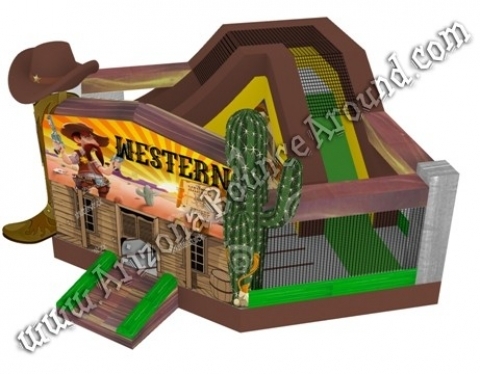 The inside features a huge inflatable slide, big bouncy play area, basketball hoop and western themed popups inside making it perfect for any western themed party or event. This western bounce house is perfect for big events or places needing inflatables with more room inside or it can also be used as a giant western prop or attention getter. We have a great selection of western themed inflatables, western themed games and mechanical bulls to choose from to make your western themed party look amazing.